This is the Strawberry FAQ hub page, linking to answers to some of the most frequently asked strawberry questions on the Internet. People aren't just hungry for strawberries themselves; they're hungry for strawberry knowledge, too! They're asking a lot of questions, and StrawberriesForStrawberryLovers.Com is feeding answers! Links to answers for some of the most commonly asked questions are listed below. Click on any of them, and you'll feed strawberry information to your mind! You'll want to read everything, since there are some very interesting facts about strawberries here! Where did the name strawberry come from? 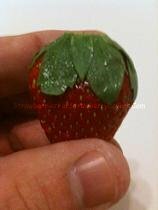 Where did/do strawberries originate from? What country did strawberries originate in? What does a strawberry plant look like? What do strawberry plants look like? Do strawberries grow on trees or vines? What makes a strawberry red? Are strawberry leaves poisonous to humans? Why do strawberries have seeds? Why is a strawberry not a berry? What countries are strawberries grown in? What states do strawberries grow in? Which states produce the most strawberries? Which state produces the most strawberries? While you're here, be sure to visit the other pages on this site, and see the other great strawberry information that's available!